Xbox Game Pass Announces Some Big Additions for April | Nerd Much? 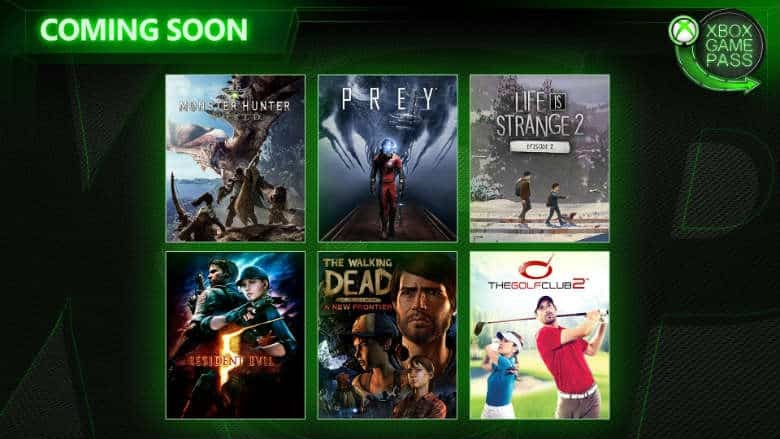 For those that have yet to try it, or have let their Xbox Game Pass subscriptions lapse, April is going to be a month that will see many people jumping back in. Microsoft revealed today that six new titles are on the way. And many of them are big time additions. April’s additions to Xbox Game Pass include Monster Hunter World, Prey, Life is Strange Episode 2, Resident Evil 5, The Walking Dead: A New Frontier, and The Golf Club 2. The first couple to arrive to the subscription service are Prey and The Golf Club 2, both arriving on April 11th. Developed by Arkane Studios for Bethesda, Prey was praised for its atmospheric storytelling and earned great reviews with a Metascore of 84 on the Xbox One. The Golf Club 2 is one of the better golf sims on the platform. The franchise added the PGA Tour license with The Golf Club 2019, but if you’re looking to hit the links on a budget, this sequel should suffice with its thousands of free downloadable courses and online societies. Monster Hunter World and The Walking Dead: A New Frontier then arrive on Xbox Game Pass April 18th. You’ve likely heard of the success story that Capcom saw with Monster Hunter World, announcing the title as its best selling game ever earlier this year with over 12 million copies sold. There’s some awesome DLC that’s been released for free too. And for those that fell behind on The Walking Dead, you can catch yourselves up with The New Frontier before jumping into the series’ final season. Finally, Life is Strange: Episode 2 and Resident Evil 5 become available on April 25th. Still regarded as a good entry in the series with a Metascore of 75, Resident Evil 5 took the series into the realm of a co-op action shooter. Because of its vast departure from the series’ prior games, fans were iffy with the new direction. Though it was still a solid experience overall that is most enjoyable with a friend. With this sextet of titles, it’ll be hard not to throw your money at Microsoft to experience the Xbox Game Pass package. And with these kind of titles available through a subscription, it’s hard not to see what kind of success the Xbox One S All-Digital edition could have.